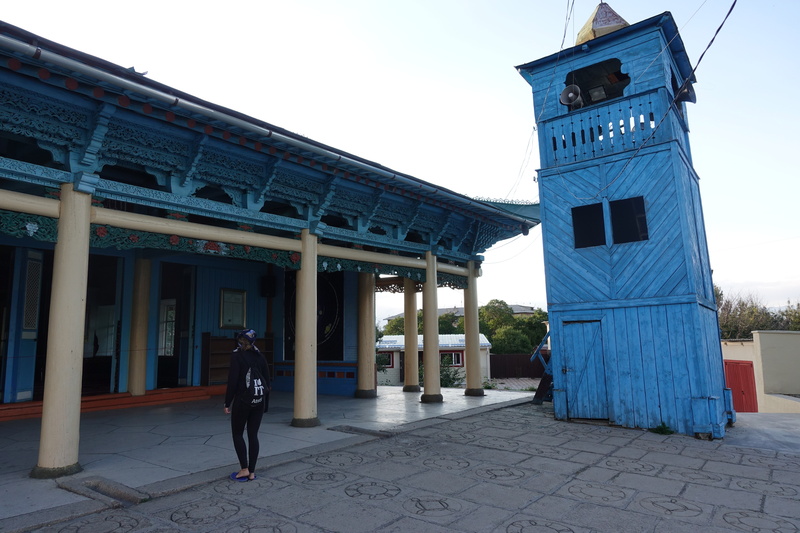 In Karakol, Cédric and I had a few things that needed to be accomplished before continuing onwards; we needed Kyrgyz money (the SOMs), a new local SIM card, food, and a good beer. After finding a place to rest for the night, we walked around the downtown, checking the items off our list. Once we were finished with our list, we found dinner and drinks with a German couple from our hotel and swapped stories of travel. 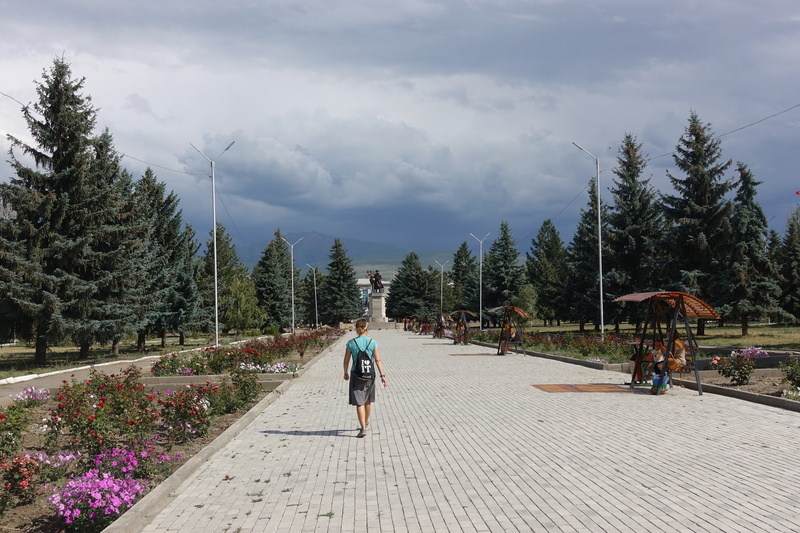 The towns and villages in Kyrgyzstan are not as compact as what we’ve become used to, with houses not directly on the street, but rather set back with much larger lots, and a center with massive soviet-style administrative buildings, surrounded by parks. 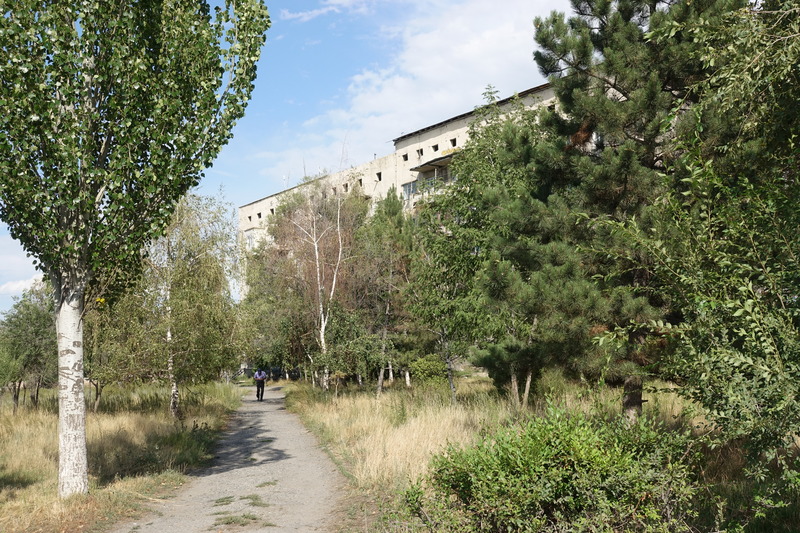 Overgrown grass grows in the void between road, sidewalk, and building and obscures most properties’ features. At times, the towns have the same quality as some less-densely inhabited parts of downtown Detroit – where you think, this surely can’t be a city proper with this amount of open space! Although the benefit to so much space is that each house has much more land and nearly everyone has fruit trees and vegetable gardens in their backyard. 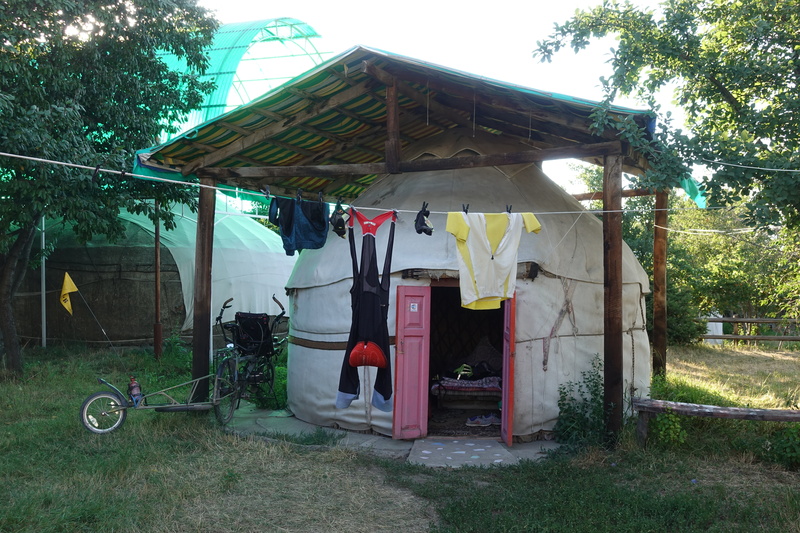 Our yurt for the night, among the fruit trees – first cherries of 2018! 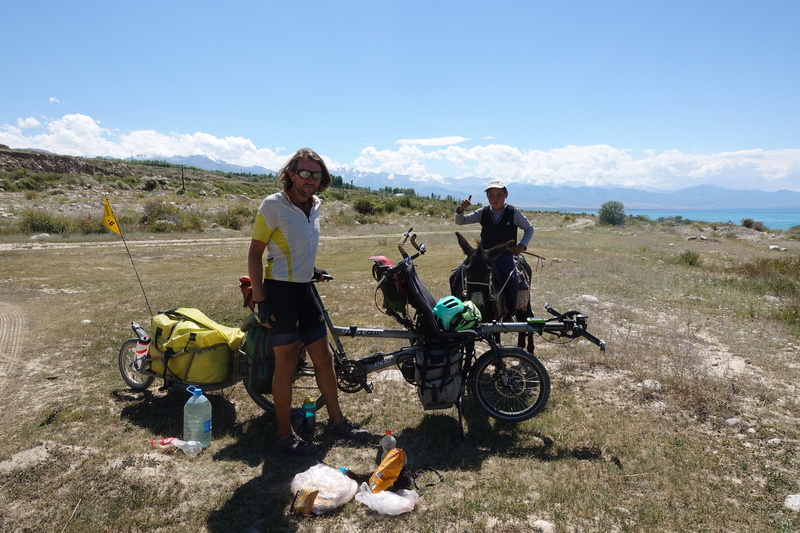 The next day, Cédric and I set out west towards Issyk-Kul lake. Almost immediately, we were wishing for the relatively quiet dirt roads that we had the day before. 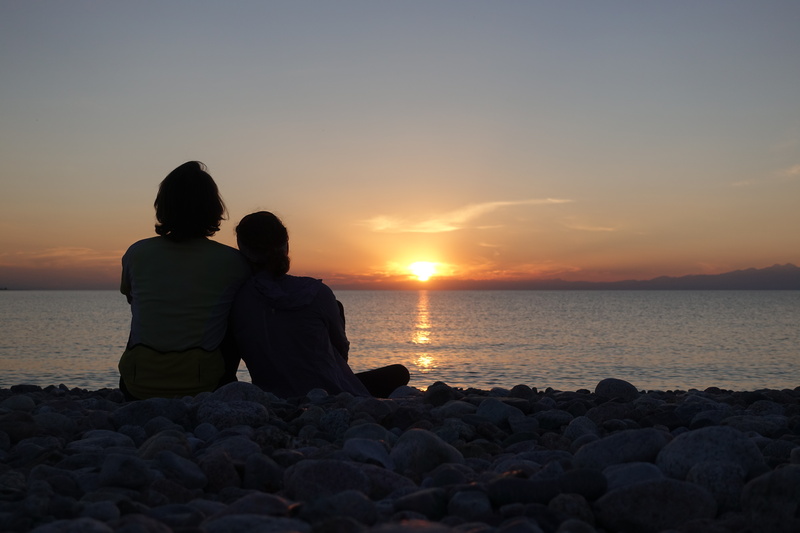 As we were told by other travelers, the roads around Issyk-Kul are not ideal for cycling; the road on the northern shore is very busy and full of drunk drivers around the holiday resorts (particularly from Kazakhstan and Russia, coming here for a cheap beach vacation spot: the local Ibiza) and the road along the southern shore is in various states of disrepair. 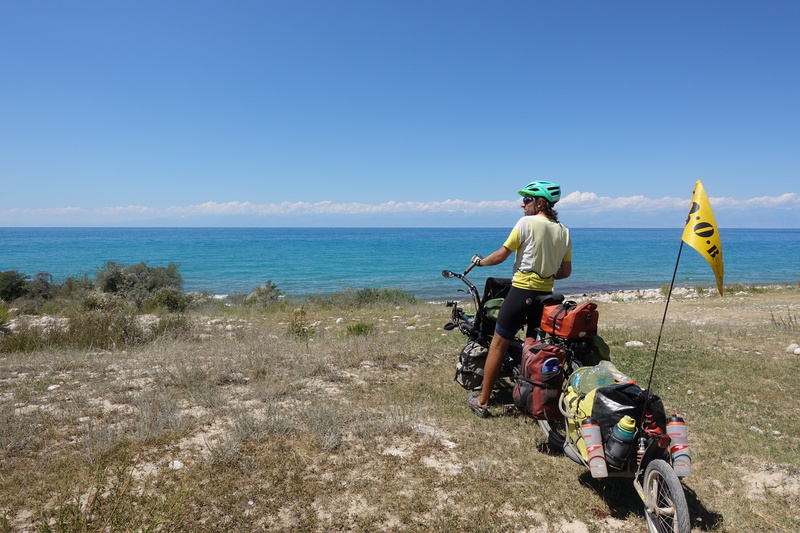 Although both lakes share similarities, it appeared that Issyk-Kul is not like Lake Konstanz and we will not have a well-marked bike path as hoped (it is also over 10 times larger!). 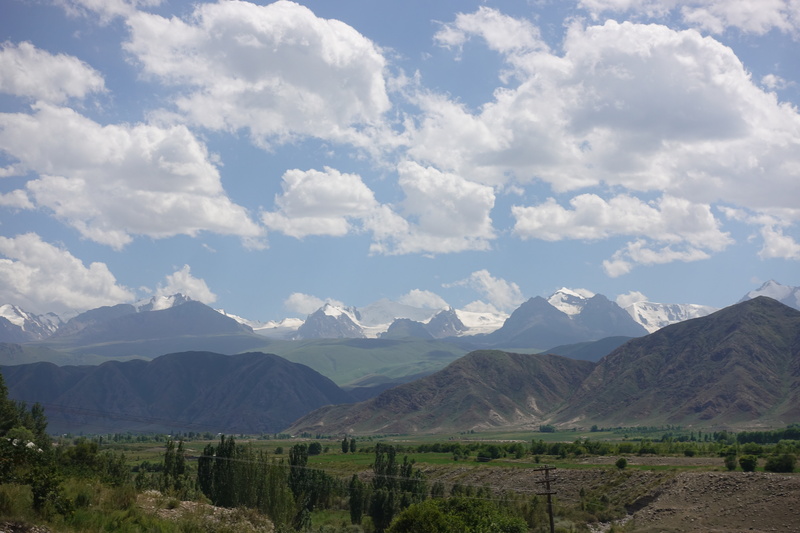 Thankfully, about 20 kilometers outside of Karakol, the road quieted down, but we still needed to constantly check our mirrors for crazy drivers. 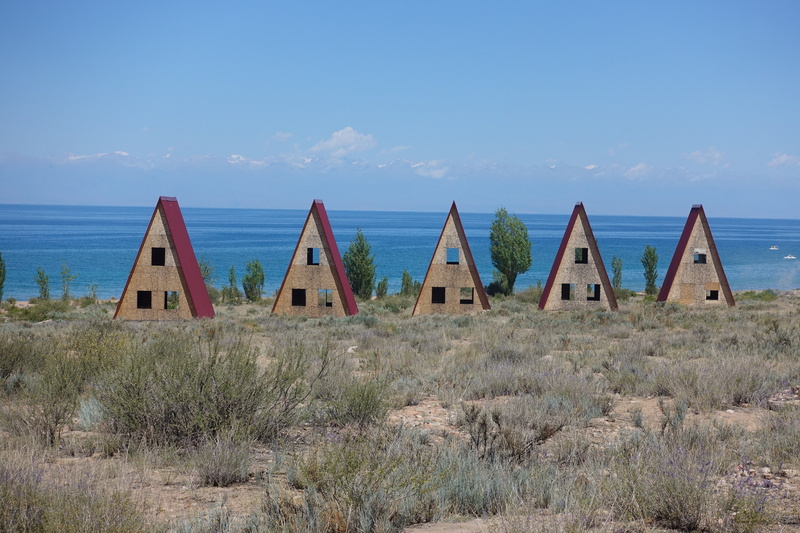 Once we reached the shores of Issyk-Kul, it was like seeing the Mediterranean Sea, but with 5000m snow-covered summits in the background. The water was a bright turquoise in the sun, but the landscape was still arid. We had lunch near the water and although the spot was ideal for camping, we decided to continue a bit further down the road. Like many of our camping spots, we found a place that wasn’t really hidden but it didn’t elicit problems during the night. 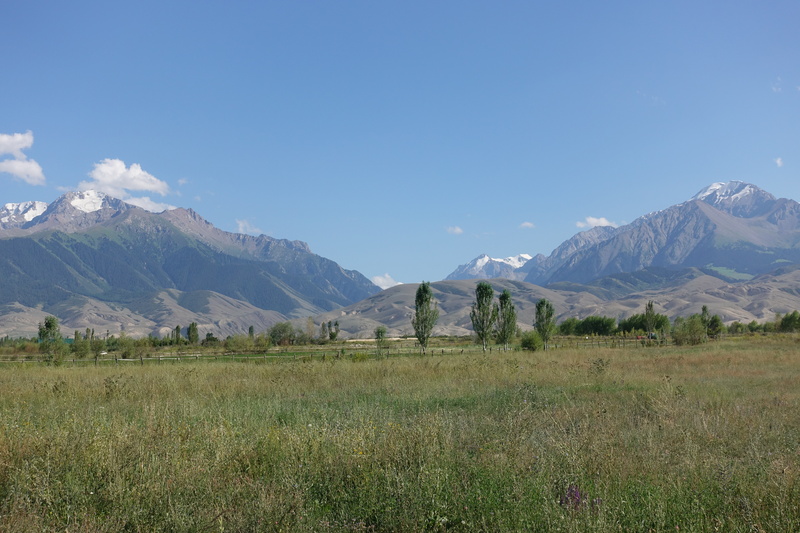 Although Issyk-Kul seems to be the vacation place of the country, there are not too many people in the highlands of Kyrgyzstan! 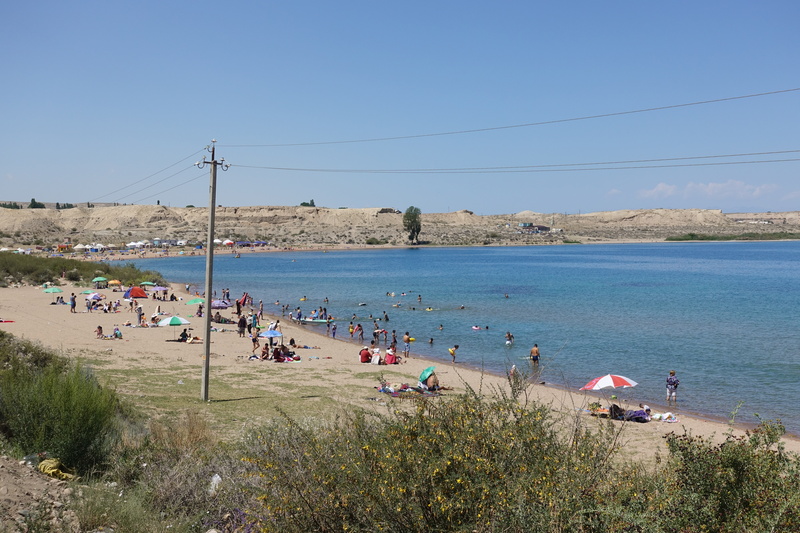 We also found out that much like the Mediterranean, Issyk-Kul was not quite like a normal lake, but was also salty. This didn’t affect our pasta so much, but the evening tea was rather disgusting. 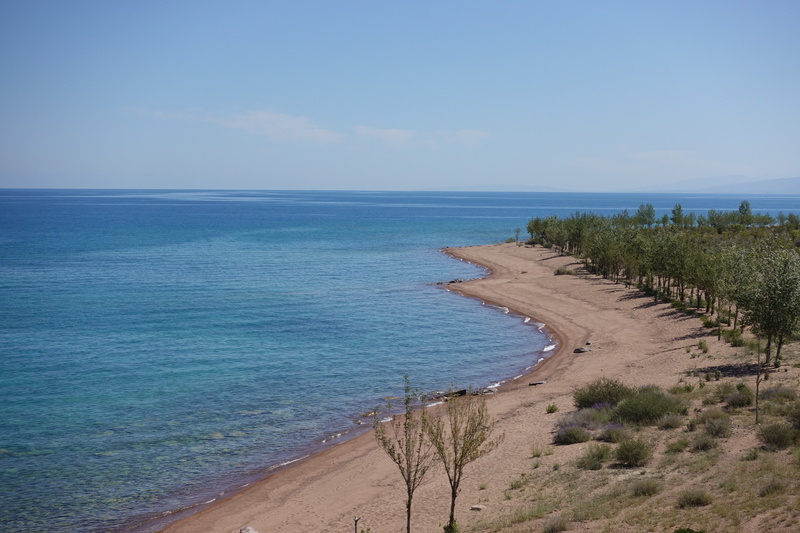 We continued our journey along Issyk-Kul, and the undulating landscapes, constantly marveling at how blue and clear the water was. In the late morning, we cycled through some holiday beach towns were shops were selling colorful inner tubes and the locals were picnicking at the beach. 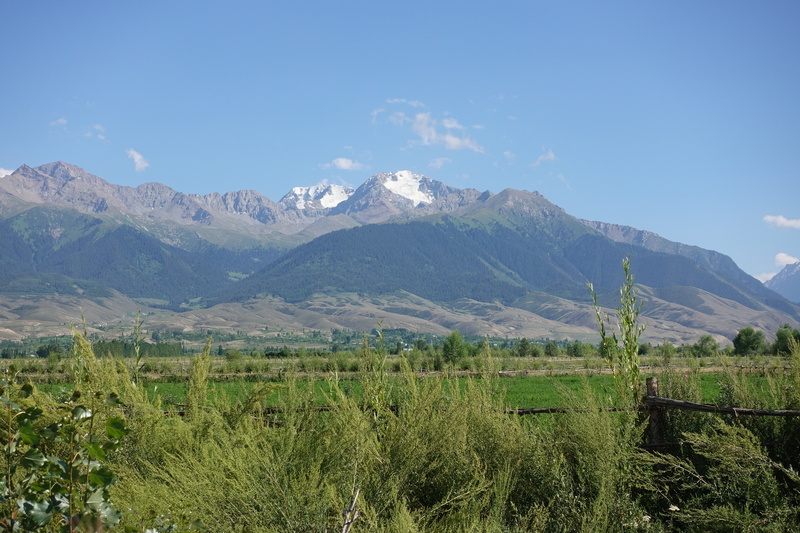 We also passed by the apricot festival, which took place near Tong. 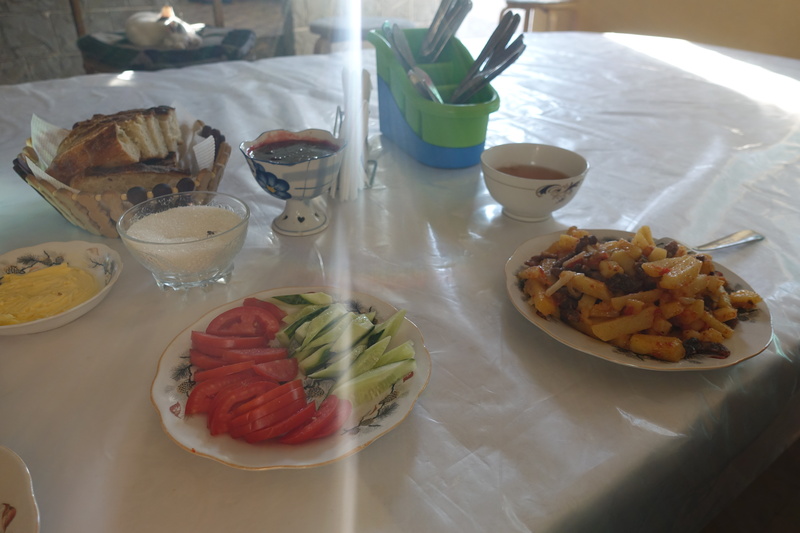 This time of year in the region is when all of the fruit is ripe for picking – so many families were selling buckets of apricots and currants in nearly every town we passed. 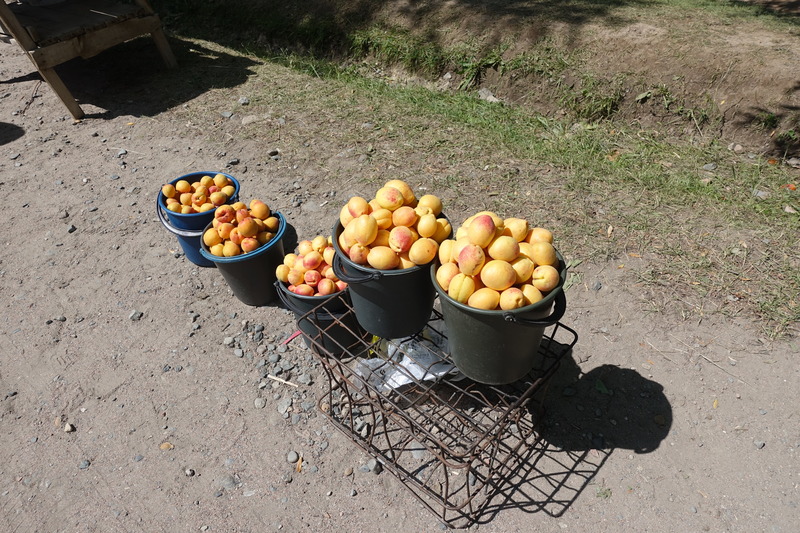 I couldn’t resist the opportunity for fresh fruit, so I made Cédric stop once or twice for a bag full of apricots. 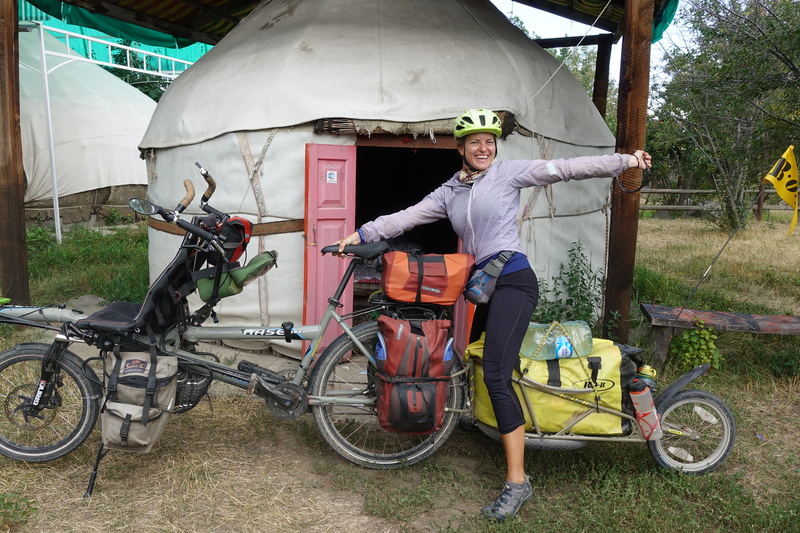 In the evening, we found another not-quite-so-hidden camp spot near the main road in Kyzyl-Tuu. 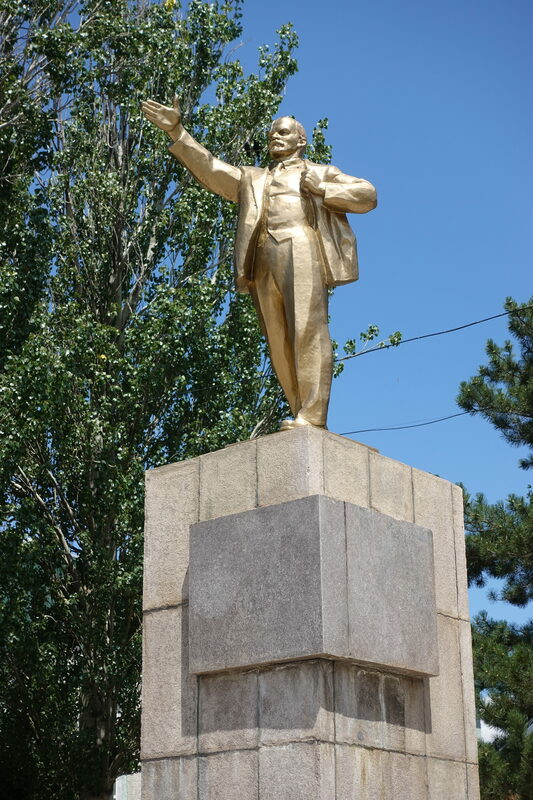 Some soviet-area artistic ”improvement” of the landscape. 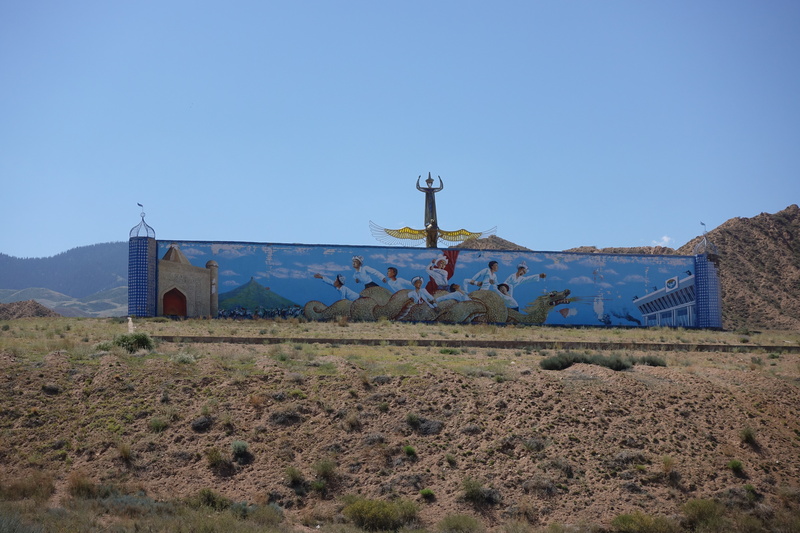 It was supposed to become a resort – only the massive gates got finished! The next day, we wanted to finish our time on the south side of the lake since the erratic tendencies of drivers were getting to us. 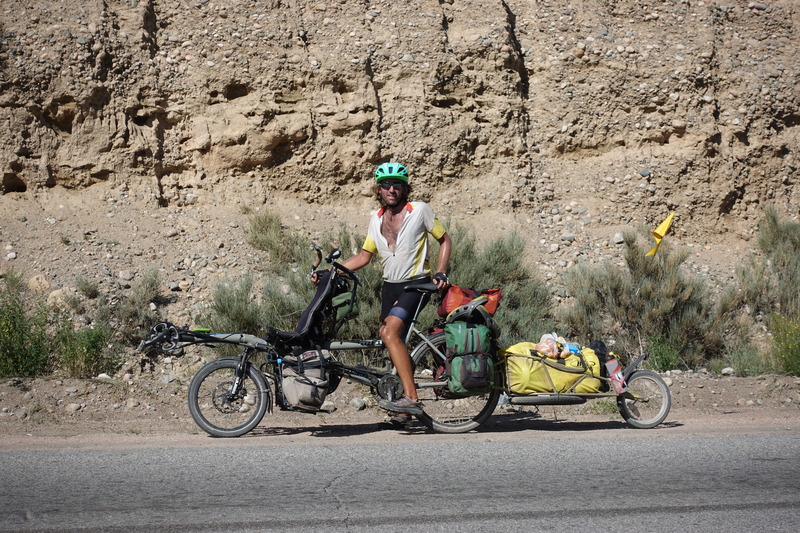 Along the way, we stopped to chat with a few other cyclists and trade information about our routes. 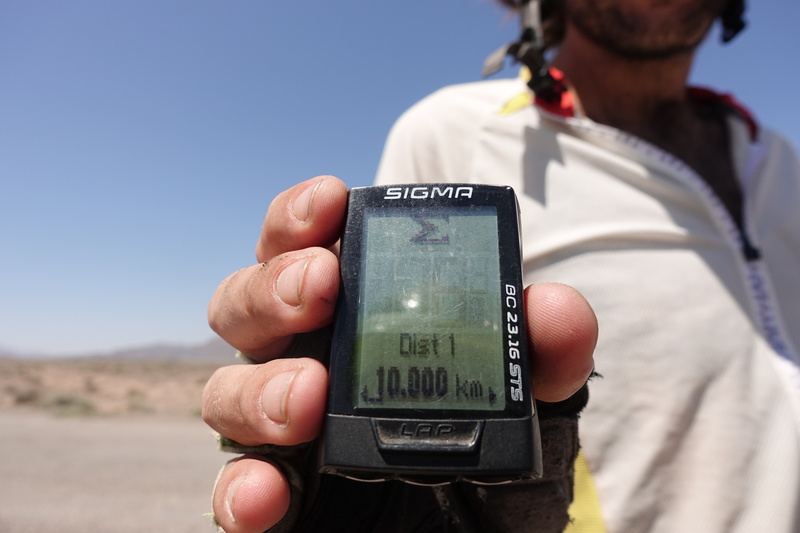 As we turned off the main road and headed towards Kochkor, we also hit our 10,000 km mark. Although the number was impressive, the landscape was not. 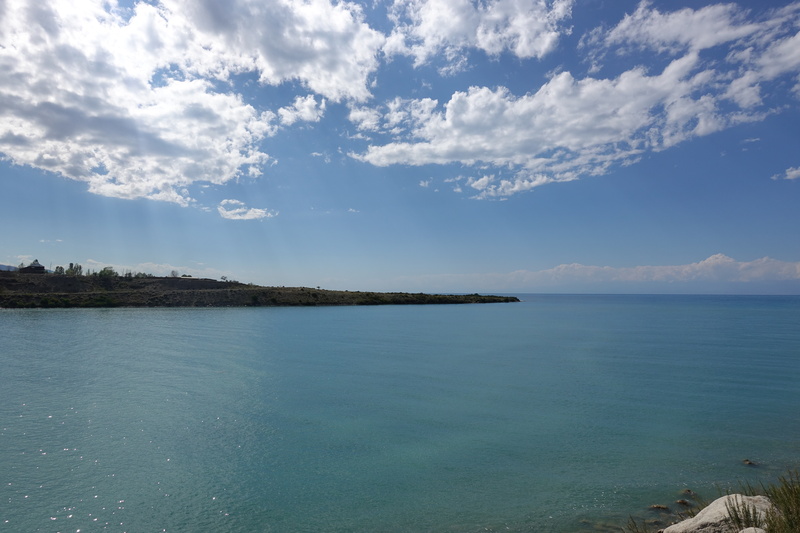 Just a few short kilometers in from the lake and the landscape became treeless and barren. 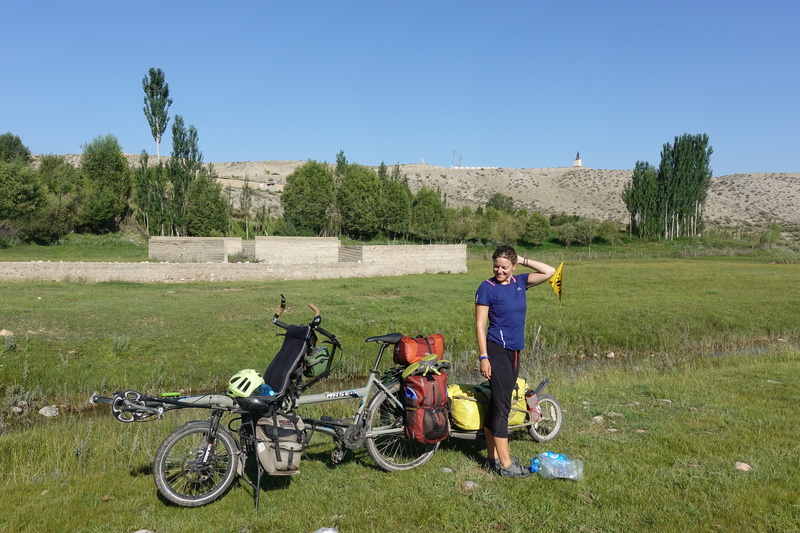 When we could, we found shade underneath the only tree for a few kilometers and had lunch. 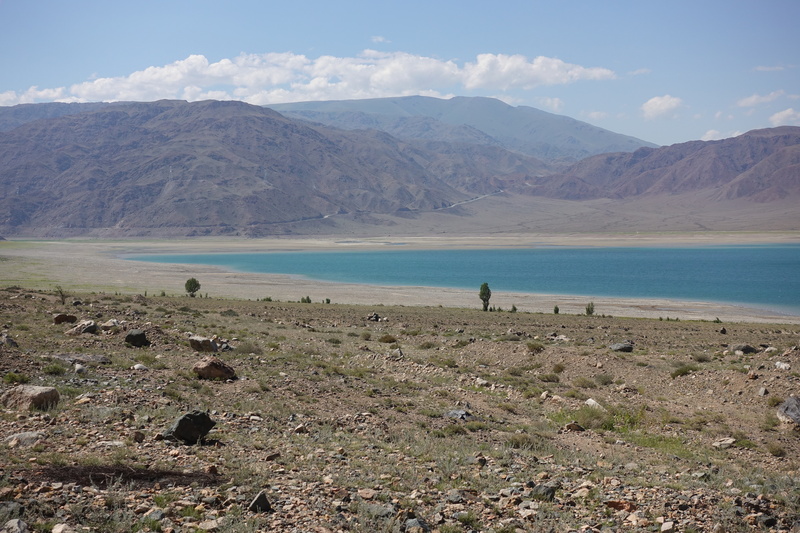 Continuing on the road to Kochkor, we passed by a large reservoir. On the map, it looked like a possible place to swim, but the reservoir was low, so we would have had to cycle a few hundred meters down to reach the water, so not very exciting any more. Instead, we continued our route and were surprised to find great asphalt shortly after the reservoir. 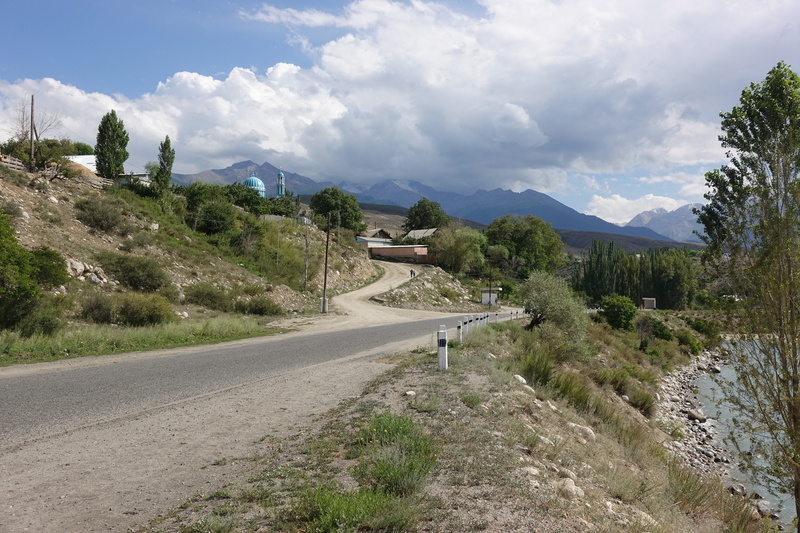 Since Karakol, the old asphalt was a small step up from dirt roads, but not ideal for cycling. 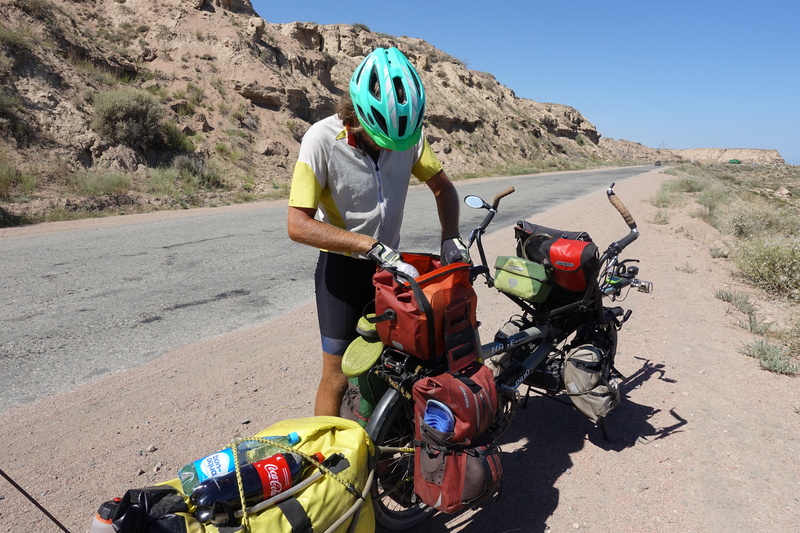 In parts, the asphalt was just large stones which made the whole bike vibrate, and other parts, the asphalt had melted and been pushed off to the side, leaving large lumps for us to cycle around and over. In this stretch, everything was new and smooth and we could coast all the way into the town. 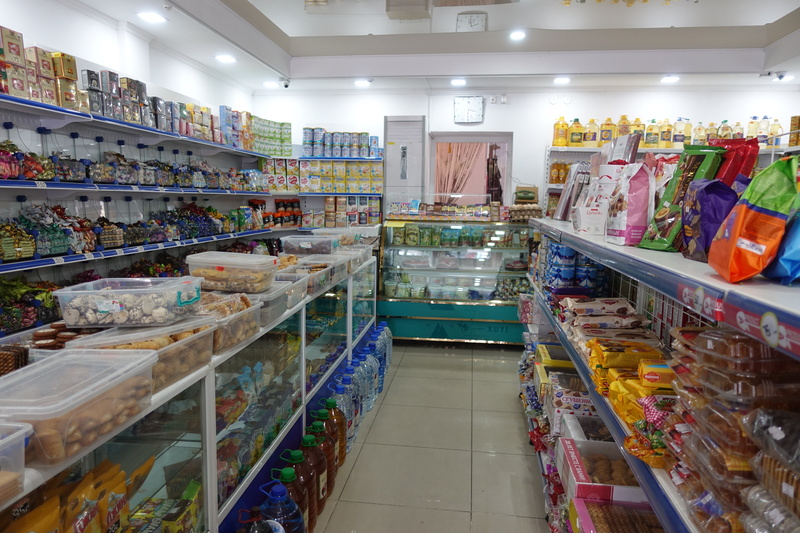 Along the way, I made the most (relatively) expensive Coke purchase of the trip – tired and still confused by the several currencies that have exchanged my hands over the past few weeks, I agreed to pay four times the price of a normal Coke, and got annoyed to have been that overcharged, this seems to be an exception in central Asia though, with prices not automatically multiplied for foreigners.